Mr CK Mishra, Additional Secretary and Director of the National Health Mission of India, described India’s progress to date, highlighting neonatal health as a key area of success. It is clear that there is no one-size-fits all program for any country, and that is especially evident in India with its large population and incredible regional diversity. Success in programming, said Mr Mishra, has been the product of both evidence and experimentation, with every faultline and major challenge leading to new ideas and innovations in programming. He highlighted the launch of the new RMNCH+A Strategy in 2013, one of the first strategies of its kind that covers the continuum of care across all stages of the lifecycle, with a special emphasis on adolescents. The strategy, he said, is flexible to account for differences across Indian states. National experiences of what works best at the country and local level, such as that shared by Mr Mishra, need to be central to the updated Global Strategy for it to have maximum impact. Dr Ado Muhammad, Executive Director of the National Primary Health Care Development Agency in Nigeria, also reinforced the importance of country leadership. He said that while countries lead, they must also mobilize and engage with all stakeholders – including the private sector – to overcome their challenges. 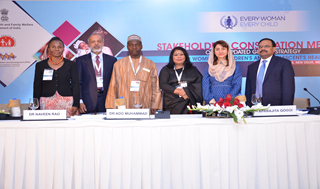 Limited human resources for health and access to life-saving commodities were identified by Dr Muhammad as key barriers to further progress in Nigeria – challenges that demand multistakeholder solutions. Panellists representing some of these other stakeholders also took to the floor to share their experience and recommendations. Farkhunda Naderi, Member of Parliament from Afghanistan and chair of the Inter-Parliamentary Union’s (IPU) committee on Democracy and Human Rights, described how Parliaments around the world have played a critical role in laws and policies to improve the health and well-being of women and children, for example, the Parliament of Bangladesh’s efforts to confront child marriage, and the Parliament of Rwanda’s work to raise awareness on family planning. Ms Naderi declared her own support for the Global Strategy, and that of the IPU Committee – a very welcome endorsement. Dr Naveen Rao, head of Merck for Mothers, and Aparajita Gogoi, National Coordinator of the White Ribbon Alliance in India, each provided recommendations for the Global Strategy which emanated from the previous day’s private sector and civil society consultations. Dr Rao reiterated four main areas identified at the private sector consultation where the private sector can contribute, namely innovation, technologies, strong management and human resources skills, and financial resources. Ms Gogoi, speaking on behalf of over 60 civil society organizations (CSO) convened the previous day by the India RMNCH+A Coalition, reported back some of their key recommendations for the Global Strategy. She emphasized the need to focus on equity and non-discrimination– geographic, and across class, caste, religion, gender, and sexual minorities, as well as the importance of defining adolescent needs beyond only sexual and reproductive health to encompass health and well-being, including school enrollment and retention, skills development, livelihoods, and political participation. The CSO gathering, said Ms Gogoi, strongly recommends that greater attention be paid to violence as barrier to improved health and well being in the new Global Strategy. She stressed the need to enhance cross-ministerial and cross-sectorial collaboration, and noted that civil society organizations have an important role to play given that they often work on a range of issues, including health, nutrition, water and sanitation, and the environment. The rich discussions and recommendations of the panel provoked an interesting discussion, and will help to shape the development of the revised Global Strategy over the course of the coming months.